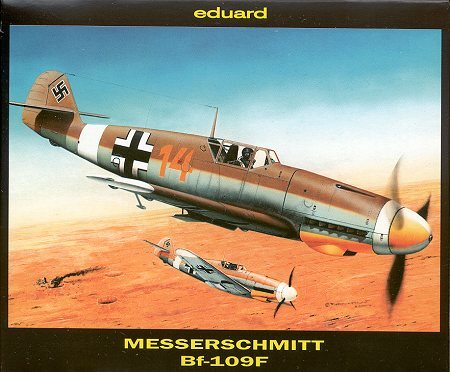 No real need to go into the long history of the Bf-109 save to say that it was the only German aircraft to be in continual production from the first to the last day of the war. It is also probably the most kitted Western aircraft that there has ever been. Add one more to that list with this one. I saw this in a hobby shop the other day and thought to myself. Hmm. What in the world could there be about this kit that makes it worth $4.99 when I can get a nice, big, Dragon A-10 for two bucks less? Well, curiosity and my penchant for 109s got the best of me and of the two available (the other being a 109G), I picked up this F model. Hurrying home, I breathlessly tore off the shrink wrap and gazed at.....one sprue with very small parts on it. Oh yes, one also gets two canopies (why is beyond me as they look the same) as well as the now expected, Polish printed, Eduard decal sheet. A very thorough sheet as well with all that one could ever want. The instruction sheet is also very well done with one page devoted to the introduction, one to the parts breakdown and paint info, one to a 3 step construction sequence and one to the camouflage and decal placement. 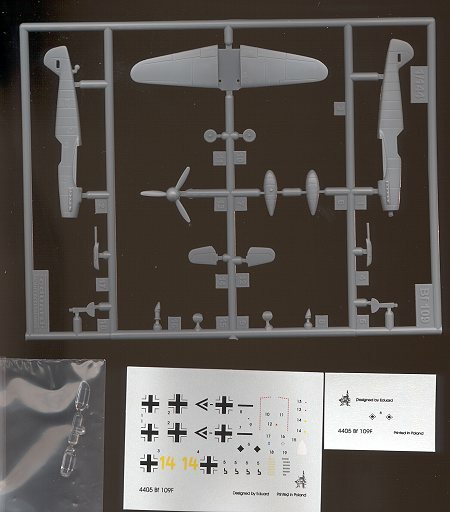 You get the option of a tropical version and, since this is obviously the same sprue as what comes with the 109G kit, you get underwing cannon packs and the nose blisters for the nose guns. What makes this kit a real poser is the wing. A good look at the wheel wells shows that this cannot possibly be for an F model because the F had circular wheel wells. As you can see from the image these have the squared off wells of the G model and rounding them off isn't really an option with a solid wing. OK, so I'll just do a G version. Well, there is a problem there as well. To do any of the later G's one needs to have the wheel bumps on the top of the wing for the wider wheels introduced with the late G-4 aircraft. This pretty well limits you to doing a late G-2 or early G-4. Not that this is a bad thing, just that it isn't what was advertised on the box top. Now those that are really 'serious' modelers probably wouldn't look twice at this kit, and those that aren't (which is what I suspect is the target), don't care, but there it is. Other than that little nit-pick, it looks like a very nice kit. Engraved panel lines, centerling fuel tank, a shape that actually looks like a 109 (other than some of the other creations I have seen), and no need to fiddle with an interior (of which there isn't even a hole). If ever there was a kit that was a 'weekend project', this is it. I have a weekend coming up. I'll let you know how it turns out. Review copy courtesy of me and my wallet!! If any of you manufacturers or shop owners want to send products for review and building, please contact me.